How did scientific studies of voles show the effects of oxytocin and vasopressin on behavior? A series of studies comparing the montane vole and the prairie vole has given us important insights into the workings of oxytocin and vasopressin. Voles are small rodents found in several different habitats. 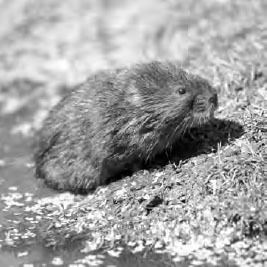 The montane voles live in fairly isolated mountain burrows, while the prairie voles live in densely populated colonies. Consequently, the two types of voles demonstrate very different social behaviors. The prairie vole, but not the montane vole, displays monogamous mating patterns and a generally high level of social behavior. Prairie voles also have higher levels of oxytocin and vasopressin. Vasopressin has been directly linked to social behaviors displayed by the male prairie vole but not his montane cousin. Specifically, male prairie voles display both partner preference and mate guarding. This means that they prefer to sit by their mates over other animals and they show aggressive behavior towards any male who comes near their mate. When vasopressin is blocked in the male prairie vole’s brain, the animal no longer demonstrates partner preference or mate guarding, although sexual and aggressive behavior are otherwise intact. Likewise, when oxytocin is blocked in the female prairie vole’s brain, both partner preference and maternal behavior decline. Studies of the humble vole have demonstrated how oxytocin and vasopressin affect behavior.